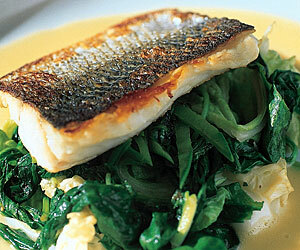 Ask your fishmonger to fillet, scale and pin bone the seabass. To make the laverbread sauce, chop 2 shallots, place in a small stainless pan with the glass of dry white wine, and reduce by half. Add the tablespoon of cream and bring back to the boil. Remove from the heat and gently beat in 250g of butter (unsalted) in small pieces. When all the butter is whisked in strain and keep warm. Warm the laverbread and add to sauce. Place a pan of lightly salted water on to boil. In a very hot pan, sear seabass fillets skin side down. When the skin is crisp turn over and remove from the heat. The residual heat in the pan will finish cooking the fish. Blanch the green beans for 1 minute, remove from the hot water and chill with cold water. Heat a wok until hot, add a little oil and stirfry the pak choi until they are just cooked and then add the blanched green beans. Place the seabass on top of the greens. Surround with laverbread butter sauce.